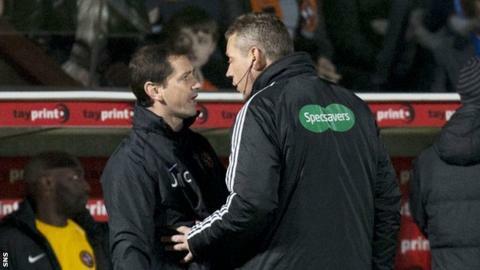 Dundee United boss Jackie McNamara has received a three-match ban for a touchline spat with Tommy Wright of St Johnstone. The managers clashed in last month's Premiership match at Tannadice, which the visitors won by a Stevie May goal. Ruling on the case, the Scottish FA's disciplinary tribunal gave McNamara a five-match ban, two of which are suspended until the end of next season. And Wright received a one-match ban, suspended until the end of 2014. For McNamara, it is his third breach of disciplinary rule 203 in three seasons and United have yet to decide if they will contest the punishment. The two men became embroiled in a heated exchange after a challenge by St Johnstone's Tim Clancy on Ryan Gauld went unpunished, resulting in both managers being sent to the stand by referee Crawford Allan. "Some things were said that shouldn't have been said by Jackie about my team," Wright told BBC Radio Scotland following the game. "I'll respond to that because it's totally out of order. A cheap shot." United felt certain decisions went against them during the game, with Farid El-Alagui and Gary Mackay-Steven both denied penalty appeals. Wright confronted McNamara on the touchline, leading to both men being ordered out of the technical area in the second-half. United face Rangers in the Scottish Cup semi-final at Ibrox on Saturday, with St Johnstone up against Aberdeen at the same venue 24 hours later.